As the mom of any preschooler can attest, early years prove some of the most important for self-discovery, confidence building and developing communication skills. This time can also be quite challenging for moms – both physically and mentally – as we try to keep up with their endless amounts of energy and constant need for activities, both fun and challenging. Engaging and educational programs like Playhouse Disney’s “Handy Manny” give us a chance to curl up with our kids on the couch and go on a learning adventure. Launched in 2006, Disney’s Emmy-nominated animated series “Handy Manny” shares the adventures of Manny, a bilingual handyman, and his talking tools. Geared toward preschoolers, the show helps kids learn important lessons like problem solving and working together while introducing them to Latin culture and common Spanish words and phrases. I’m struggling to teach my girls Spanish, so every little bit counts! If you have a Handy Manny (or NASCAR) fan in your house, get ready – on Saturday, March 20th a brand new primetime special, Handy Manny Big Race, will air on the Disney Channel. Guest stars Dale Earnhardt, Jr. and Lance Bass join Wilmer Valderrama (the voice of Manny) and the rest of the “Handy Manny” gang as they prepare for the famed Wood Valley 500 race. Manny and the tools team up with Eliot to revamp his used race car, as race time approaches, Elliot’s nerves get the best of him. Famous racecar driver, Chase Davis (Earnhardt, Jr.) and Manny both jump in to help. What happens next? Tune in on March 20th at 7pm EST/6pm CST to find out! Visit Handy Manny’s Facebook Page for more information. Plus, on Playhouse Disney’s website you can find a Handy Manny Big Race Online Game, as well as tips and recipes to help you create a special Handy Manny family night. Go, Manny, Go! Saturday, March 20th at 7pm EST, 6pm CST. Update: Mom Central is holding a Handy Manny Twitter Party tomorrow (Saturday) night from 6:30 – 7:30pm ET using the hashtag #HandyMannyBigRace. They’ll be giving away great Handy Manny toys and $50 gift cards. More information is available on their website. I wrote this review while participating in a blog campaign by Mom Central on behalf of Playhouse Disney. Mom Central sent me a gift card to thank me for taking the time to participate. 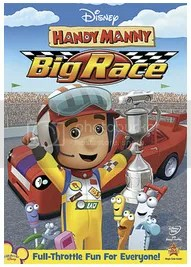 Does anyone know when the next showing of the Big Race will be? We taped it yesterday, but accidently erased it after watching it.